Finally, the wait is over. As technology companies battle for the living room, Roland has built the ultimate convergence device. The VIMA concept keyboard addresses the need of the average home consumer to play organ and keyboard sounds, manage digital photos and videos, and perform karaoke using a single, integrated product. The days of having to play 88-key keyboards without the convenience of transforming your digital video and photo content into interactive karaoke performances can now be a distant memory. Translate what I just said to Japanese, and I think it might make sense. Roland has just unveiled VIMA (rhymes with ZIMA), “a new concept keyboard that blends various musical and visual content applications into one consumer-friendly unit.” Yes, previously you needed a Mac with iLife to make soundtracks for your videos and photos, a digital piano, and a karaoke machine, just to get the functionality that’s now combined in the VIMA. I know there have been countless times where I wished I could transform my keyboard into a karaoke machine, so this should come as a major relief. 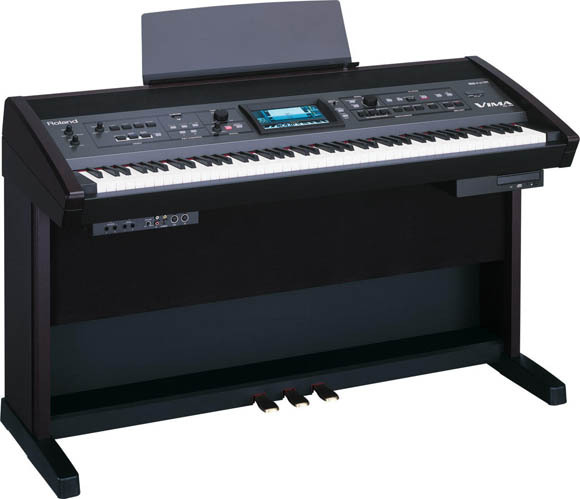 Side note: I know we have some CDM readers in Japan, so maybe you can tell me if it is in fact more likely that you’d find an 88-key digital piano / karaoke workstation in a living room there than here. If so, your country really is awesome. VIMA or Video Interactive Musical Application is a new kind of entertainment unit that allows anyone to take part in the video/audio experience. The concept is simple: simply plug in any audio or visual device that you have in your home, such as a video camera, iPodÃƒÂ¢Ã¢â‚¬Å¾Ã‚Â¢, DVD player, or television and then, with a few button pushes, create your own videos, customize your karaoke experience, or compose your very own soundtracks for your digital photo albums. Additionally, audio CDs, DVDs, MP3s and any other digital images/multimedia content the customer may have archived, can be loaded onto the VIMA for hours of customized family entertainment. The home karaoke experience has never been this easy. By connecting a television and a microphone to the VIMA (both sold separately), customers can sing along to music while lyrics are displayed on the screen. Families and friends can also connect two microphones for duet-style performances. Thanks to Roland’s progressive technology, VIMA also comes equipped with 264 built-in musical instrument sounds, and a “vocal effect” function that manipulates the sound of the human voice for additional entertainment. VIMA even contains a “center Cancel function” that can mute the vocal part of an audio CD, allowing singers to add their own vocal stylings. The dynamic and feature-rich VIMA is designed with the whole family in mind and comes fully equipped with Key Number Sheets for easy play-along fun, a Melody Guide, and Tempo Adjustment functions. With the attached wireless remote, home-entertainers can freely control the music tempo, key, and songs from anywhere in the room–for hands-free ease of use. Roland has also included the VIMA TUNES CD-ROM that displays lyrics, music scores, and a dynamic library of slide-show images for creative performances. The new VIMA is available in two sizes, the RK-100 entry level VIMA and the more advanced RK-500 VIMA. NAMM: MiKo Keyboard/Computer Groovestation Home Entertainment Center? … and, no, we didn’t ultimately see MiKos at Best Buy. No web link, pricing, or availability on VIMA yet; stay tuned.